‘It’s a really exciting time for us at Edinburgh Napier University, as our colleagues in Equate launch their new ‘Career Hub’ webpage. As an applied and inclusive university, we believe that providing gender equality for all of our staff and students is instrumental in achieving our vision for our Strategy. 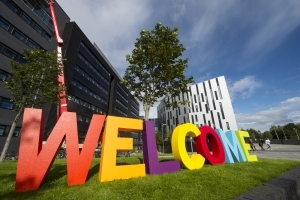 It’s great to see an organisation with great working relationships with Edinburgh Napier University promoting this so passionately across external employers within the STEM industries. As a relatively new staff member (joining the university last year), I came from an industry background in STEM recruitment. I see daily the work carried out by Equate, in particular this project, as essential in tackling some of the inequalities faced by women striving to further their careers within STEM. When I joined the university, I was attracted at the opportunity to become part of a new centralised recruitment function within HR. The goal of which was to build robust recruitment processes to support the university in achieving its strategic talent attraction goals. A key focus of this new team is ensuring we are attracting and retaining female staff across the university and contributes fundamentally to our equality aims. And our senior leadership team mix remaining gender balanced, with a current mix of 10 females and 8 males. We recognise that more still needs to be done to bridge the gap when it comes to more senior level academic appointments, however we’ve also made a strong commitment to continue to address this over the upcoming academic year and to continue further with our commitment to the creation of an inclusive culture. We also recognise that this change in culture does not just come from the recruitment process – it’s a combined effort from like-wise, inclusive minded staff across our university. It’s great to work in such a collaborative and supportive environment. A key part of my role as a Recruitment Consultant is ensuring we keep transparent and fair recruitment processes across all our schools and business areas whilst constantly promoting the wide range of inclusion initiatives available to staff. This includes initiatives around gender based violence, flexible working and the introduction of a range of professional support networks. Our university is proud to say that our women’s network is open to colleagues of all gender identities to attend. It provides an engaging forum primarily for the discussion of issues affecting women and gender equality at the university and beyond.